how live with it ? 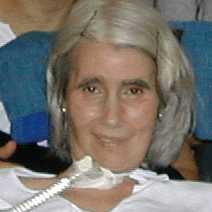 In September 1995 I started an Amyotrophic Lateral Sclerosis (ALS), also called Lou Gehrig's disease. I was then, less than 52 years old, and taught mathematics at Paris VII university. I am now almost entirely paralysed, have a feeding tube, a tracheotomy and to crown it all, I do not speak any more. To express myself, I use a computer with a switch-access software and a muscular switch attached to my cheek, which I activate with little jaw movements.